It’s understandable to lose track of every nook and cranny in the massive budget deal Congress recently approved, including an important revision and extension of a key carbon capture incentive (more on that HERE). But embedded in that deal was another update to the tax code too important to overlook. In fact, it is the most impactful congressional action to propel the future of nuclear energy in more than a decade: A guaranteed tax credit for more than 3,000 MW of new advanced nuclear! Lawmakers included a bipartisan plan – led by Reps. Tom Rice (R-S.C.) and Earl Blumenauer (D-Ore.) and senators such as Tim Scott (R-S.C.), Johnny Isakson (R-Ga.) and Cory Booker (D-N.J.) – to fix the 45J nuclear production tax incentive. (We previously talked about this fix last year as a necessary response to the suspension of the VC Summer reactor construction). 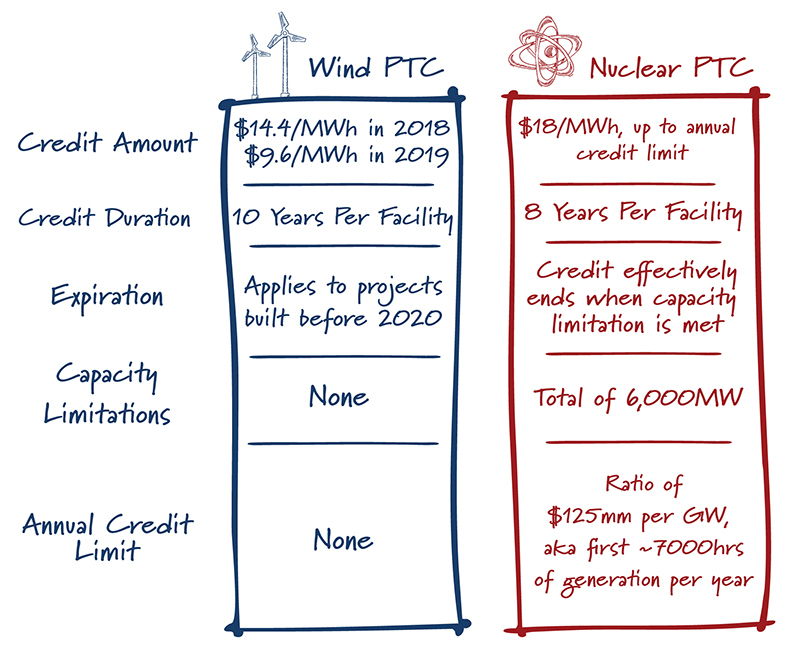 The reform package included three central components: eliminating a 2020 placed-in-service deadline, improving its transferability so all types of power providers can utilize it to build new nuclear power plants, and simplifying the qualification process providing more certainty to investors. It frees up the credit to be used not just to help complete Georgia Power’s Plant Vogtle AP1000 reactor project – the first new U.S. nuclear order since 1979 – but also advanced technologies that are the future of nuclear energy. We have long advocated for a technology-neutral credit to allow development of a number of competing advanced reactor technologies, which can all play very different roles in our energy sector. 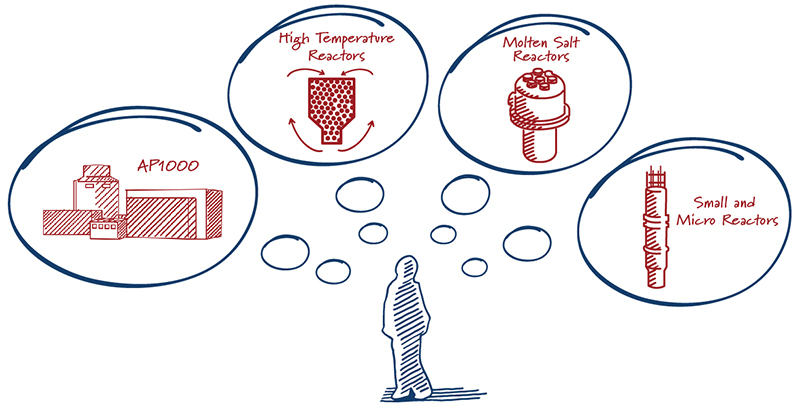 Imagine this potential advanced nuclear deployment scenario: Two full small modular reactor plants offering clean large-scale power, a dozen microreactors powering military and rural/remote locations, several high-temperature reactors providing heat for industrial processes, as well as a prototype molten salt reactor.1 The improved 45J credit is enough to support all of these and more. 45J is a production tax credit of $18/MWh for the first 6,000 MW of advanced nuclear developed in the United States.2 Advanced nuclear facilities receive the credit for the first 8 years of operation. (They are limited, however, in any one year to only 80 percent of the potential credit for that year).3 Roughly 2,200 MW of that 6,000 MW capacity limitation will be allocated to the AP1000s at Plant Vogtle in Georgia – leaving up to 3,800 MW of additional qualifying advanced nuclear capacity. As many proposed advanced nuclear designs are much smaller than existing reactors, the 3,800 MW of capacity goes a long way. It’s enough for the advanced nuclear technologies listed above, or many other variations. The most important part is that 45J is not limited by either technology or time — simply the first facilities to market can claim the capacity. Since its fix, this credit is perfectly designed for stimulating nuclear investment. With a capacity allocation now framed by those placed first in service, the credit offers a reward for first movers that only pays once the project delivers. But wait, what about Vogtle? While we primarily focus on advanced reactors, the 45J fix was the final federal action needed to complete Vogtle. Finishing Vogtle maintains our nuclear construction workforce and allows us to mount competitive bids for nuclear exports internationally in areas with large power demand like Saudi Arabia – at least until advanced reactors are ready for market. With all policy pieces now in place, the Vogtle expansion will potentially be in service by the end of 2024. What else do we need for advanced nuclear? The tax credit on its own is likely insufficient. As spotlighted in a recent ClearPath white paper, without an interim source of high-assay low-enriched uranium (HA-LEU), many advanced nuclear concepts will be forced to import fuel from China or Russia to fuel their first units. A fast-spectrum test reactor user facility (also called the versatile fast test reactor) is also a must. This facility allows experimental testing and regulatory approval of fuels and materials that is currently unavailable in the U.S. In fact, there is currently no fast spectrum testing capability for American companies to use worldwide! The president and Congress have proposed budgets and bills supporting a fast spectrum reactor, but work must continue apace. Congress should consider setting moonshot technology demonstration goals for advanced nuclear, as proposed by ClearPath in a recent hearing. Some indirect financing may be required for the first advanced nuclear reactors. This could include modifying statute for the DOE to enter into long-term power purchase agreements for new nuclear and preservation of the remaining $8 billion in advanced nuclear loan guarantee authority at DOE. These have their pros and cons, but at least one of these financial vehicles is necessary. Continued regulatory reform within the Nuclear Regulatory Commission. While the NRC continues to develop and improve the technical aspects of licensing advanced reactors, there are a number of other reforms that are needed. This includes modification of particularly burdensome regulatory stages, such as the Advisory Committee on Reactor Safeguards (a regulatory holdover from the pre-NRC era), and environmental reviews (particularly for SMRs). A waste solution. This comes last not because it’s unimportant, but because developing advanced reactors can ultimately be part of the solution and could make the total cost of dealing with nuclear waste much cheaper. Fast “burners” can greatly reduce waste volumes and radioactivity by recycling waste from existing reactors, all while producing useful heat and power. From a long-term perspective, waste recycling along with a final repository can greatly reduce the cost of total disposition.